Chief Minister Datuk Patinggi (Dr) Abang Johari Tun Openg (second row, 8th left), Pro-Chancellor of Curtin Sarawak Datuk Patinggi Tan Sri Dr George Chan Hong Nam (second row, 7th left), Curtin Sarawak pro Vice-Chancellor, President and Chief Executive Professor Jim Mienczakowski (second row, 3rd right) and Yayasan Sarawak director Azmi Bujang (second 5th right) posing for a group photo with the award recipients, parents and teachers after the presentation ceremony on Wednesday. MIRI: A total of 136 recipients from 19 schools in Miri, Subis and Baram received excellent student awards from Yayasan Sarawak in a ceremony held at Curtin Malaysia, Miri campus here last Wednesday afternoon. The recipients had excelled in their SPM and STPM (10 recipients) examinations for last year. 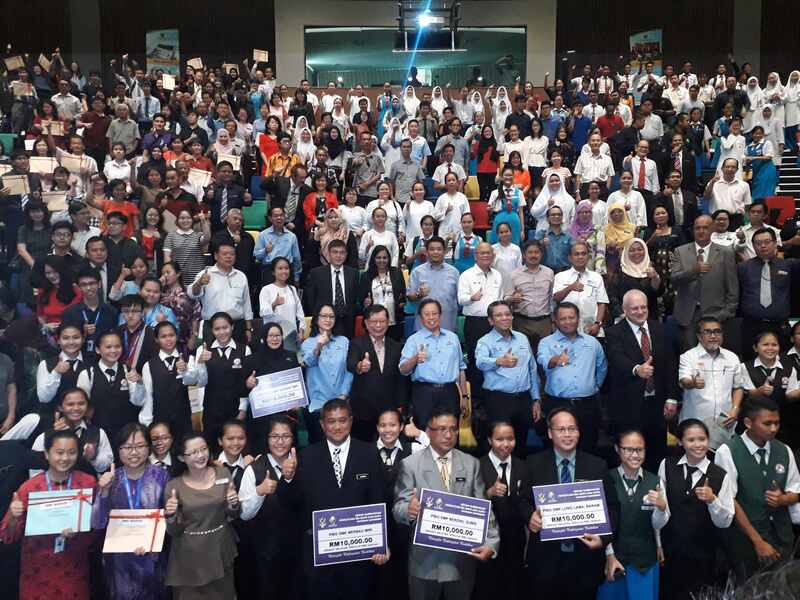 Recipients for the SPM awards received Bank Simpanan Nasional (BSN) premium savings certificates worth RM500 each, while the STPM recipients received BSN premium savings certificates worth RM700 each. At the event, the State government also presented grants worth RM10,000 each to Parent-Teacher Associations (PTA) of five secondary schools namely SMK Luar Bandar Miri, SMK Merbau, SMK Luak, SMK Long Lama, Baram and SMK Bekenu,Subis. Chief Minister Datuk Patinggi (Dr) Abang Haji Johari Tun Openg officiated at the event. In his speech, Abang Johari pointed out the importance of digitalisation for the country in future. “We need creative students through different disciplines (subjects) to try to identify new strategic disciplines when you are going into higher education because we want Sarawak to be digitalised too so that we are comparable to other countries,” he explained. Abang Johari also mentioned how Estonia becomes the most digitalised country in the world. “In Estonia everything is digitalised. Hence,I encourage our students to identify new strategic disciplines and embrace technology. Today we are going for big data analysis besides ‘Artificial Intelligent (AI)’. “Identify courses that offer knowledge and employability skills which are very much in demand in today’s world,” he advised. The award presentation ceremony held at Curtin Malaysia, Miri campus was the third attended by Abang Johari in the past few weeks. Similar event was held by Yayasan Sarawak in Kuching followed by Sibu recently. Also present were Yayasan Sarawak director, Azmi Bujang, Pro-Chancellor of Curtin Sarawak Datuk Patinggi Tan Sri Dr George Chan Hong Nam, Curtin Sarawak pro Vice-Chancellor, President and Chief Executive, Professor Jim Mienczakowski. Meanwhile, Yayasan Sarawak director Azmi Bujang disclosed that since the establishment of Curtin Malaysia Miri campus, 20 years ago, the foundation has sponsored 931 students at the university involving a total of RM57 million. “Currently, the foundation is sponsoring a total of 93 students who are studying at Curtin University Malaysia Sarawak Miri Campus involving a total of RM8.2 million,” Azmi said. He added that total commitment for scholarships and study loans for 2018 by the foundation involved RM64 million. In 2017 a total 1,432(out of 37,092 SPM students and 5,329 STPM students in the State) received the excellent student awards from the Yayasan Sarawak. 136 students receive awards from Yayasan Sarawak 0 out of 5 based on 0 ratings. 0 user reviews.